With more than three trillion events archived by eDNA Enterprise Data Management servers each week, companies around the world are achieving significant productivity, efficiency, and reliability improvements through advanced data analysis and visualization. The highly-scalable software platform has an enterprise data historian that efficiently archives and quickly retrieves time-series data, in both business and operational environments. Lossless compression technology minimizes the required storage capacity while maintaining original data resolution. eDNA Enterprise Data Management’s standard interface library is equipment and manufacturer-agnostic, enabling you to link to hundreds of business, control, and automation systems. Its distributed services architecture processes information on a single server or enables distribution on multiple servers throughout a series of networks, allowing unlimited scalability. eDNA Enterprise Data Management uses advanced, lossless data compression to maintain information integrity. Redundancy enables high availability and fault-tolerant 24/7 collection and access to real-time data. An integral part of operations, eDNA Enterprise Data Management delivers continuous value year after year as it scales to meet your growing data management needs. 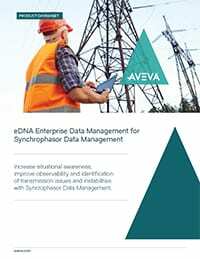 Native databridge capabilities can be easily replicated across the network from plant-level historian to eDNA Enterprise Data Management, and seamlessly integrate with ERP, CMMS and other business systems. Having real-time access to critical data in the right format and at the right time transforms raw data into insights for timely and informed decision support. eDNA Enterprise Data Management presents real-time and historical data through advanced client tools. A predefined function library helps users define custom calculations and expressions. Secure valuable data and ensure that the right data gets into the right hands while addressing complex security and compliance requirements. Access raw and aggregated information in a specified format or through ad-hoc queries. Send an email or text message to a computer or mobile device with alarm information. Provides a graphical display of information to accurately depict the current condition and status of your plant and systems. Custom screen development is made easy and data points are quickly added with a few simple mouse clicks. A complete library of graphical symbols, gauges, and trending controls are included for advanced visualization. Enable users to make informed business and operational decisions with this real-time decision support platform. eDNA Enterprise Data Management Web provides secure access to the many real-time, historical, and relational data sources that drive operational profitability. Web comes configured with a series of advanced analysis tools that allow users to simplify decision making and focus on the key performance indicators that lead to optimised system performance and profitability. It gives the user control over the graphical representation of data with presentation tools that ensure end users can easily customise displays, reports, trends, and much more – all from their favourite web browser. The Excel Add-in is great for building custom, time-series data reports in Microsoft® Excel and for ad-hoc data queries. Users can retrieve raw historical data, aggregated data (e.g. min, max, average), or live updating real-time data. The Add-in also includes many embedded functions that can be used to create your own Excel macros. Trend allows users to graphically visualize their time-series data in a variety of charting styles – line, polar, scatter, pie, bar, 2d/3d contour. The data can be displayed with original, high fidelity resolution or with user defined aggregates. Trend can access hundreds of thousands of historical records in under a few seconds. 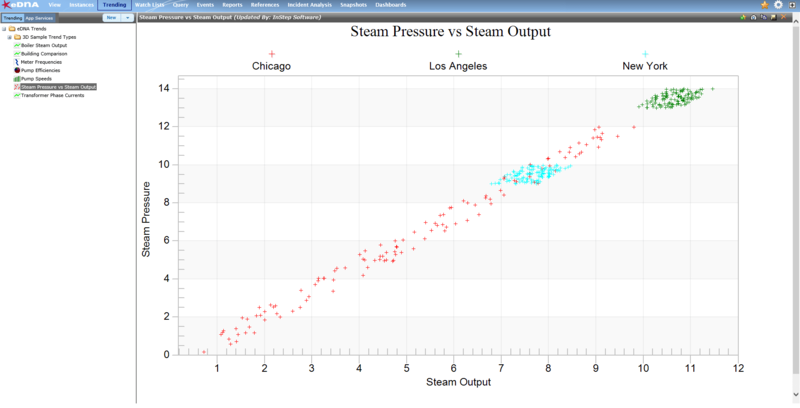 Trend data can be saved for later reuse, shared with other members of your team, or exported to Microsoft Excel. CHaD (Component Hierarchy Database) provides the ability to organize information from the eDNA Enterprise Data Management platform and a variety of other enterprise data sources using an object-oriented information model. This information model provides context and organises large datasets allowing even casual system users to easily find and comprehend their industrial data. This condition-based maintenance module supports the creation of user-defined events for notification and sends urgent machine and equipment data to the people responsible for diagnosing and resolving potential problems. 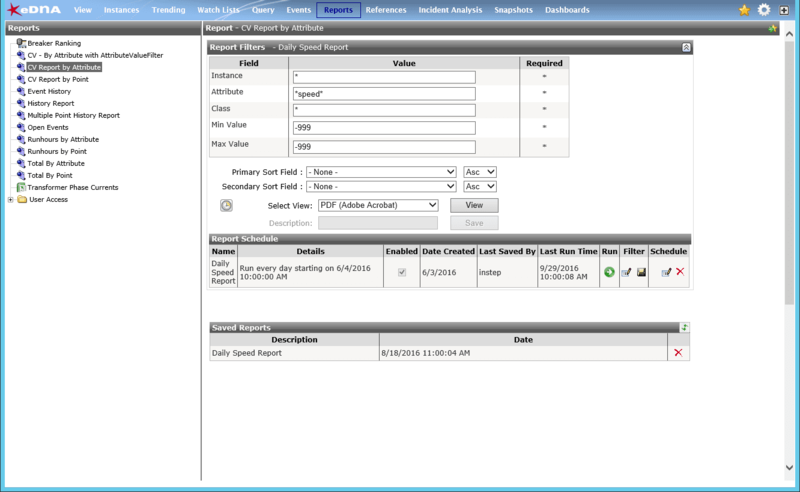 The eDNA Enterprise Data Management uses the existing Enterprise Historian product suites to alert users to potential concerns. The module offers point-and-click configuration of simple or complex event rules based on any data source, email notification of events, the ability to attach trends or reports to notifications and a user-friendly event-viewing interface.